To come up with the next iPad, Amazon or Facebook, the last thing potential innovators need is a group brainstorm session. What the pacesetters of the future really require, according to new Wharton research, is some time alone. In a paper titled, “Idea Generation and the Quality of the Best Idea (PDF),” Wharton operations and information management professors Christian Terwiesch and Karl Ulrich argue that group dynamics are the enemy of businesses trying to develop one-of-a-kind new products, unique ways to save money or distinctive marketing strategies. Although several existing experimental studies criticize the team brainstorming process due to the interference of group dynamics, the Wharton researchers believe their work stands out due to a focus on the quality, in addition to the number, of ideas generated by the different processes — in particular, the quality of the best idea. They say the research is also distinctive in its study of how teams select the most promising initiatives that come out of the brainstorming phase. Forty-four University of Pennsylvania students were recruited to help test how the two processes fared. The undergraduate and graduate students were divided into groups of four and asked to employ the hybrid process and team process separately to come up with student-friendly new product concepts for a hypothetical sports and fitness products manufacturer and for a hypothetical home-products manufacturer. Teams were given 30 minutes to brainstorm using the traditional group process. To test the hybrid model, they were asked to spend 10 minutes generating and ranking ideas individually and 20 minutes discussing those thoughts as a group. The ideas generated by both methods were evaluated independently, by three separate panels asked to evaluate the product ideas on their business value; attractiveness to potential customers and overall quality based on the feasibility of actually building the product; the idea’s originality; the size of the potential market for the product, and the extent to which it solved a particular problem. The students came up with a total of 443 ideas — including a trash can that reduces the odor of the garbage inside it, a water bottle with a built-in filtration system and a waterproofing system that allows for reading in the shower. Business leaders trying to integrate innovative ideas into their office culture can learn from the structure and intricacy used to generate and evaluate the ideas, suggests Terwiesch. He and Ulrich are also co-authors of the book, Innovation Tournaments: Creating and Selecting Exceptional Opportunities, which suggests that companies should use coordinated competitions to filter the most exceptional proposals. He says an online system that creates a virtual “suggestion box” can accomplish the same goal as long as it is established to achieve a particular purpose. “People like having a process because they understand that it’s fair. 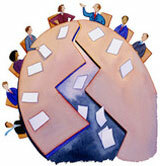 In a typical brainstorming meeting, it’s not fair and everybody knows it: The boss is always right,” Terwiesch says. The results of the experiment with the students showed that average quality of the ideas generated by the hybrid process were better than those that came from the team process by the equivalent of roughly 30 percentage points. The hybrid method resulted in about three times more ideas than the traditional method. In addition, the quality rating was higher for the top five ideas produced through the hybrid process — and the difference in quality between the team and hybrid methods in terms of the best idea was much higher than the average difference in quality, suggesting that “in an innovation setting, examining only [average] quality as opposed to the quality of the best ideas is likely to underestimate the benefits of the hybrid approach,” the authors write. There are several reasons why people are less likely to offer an unbiased opinion in a purely team-based brainstorming process. Employees might censor themselves to go along with the status quo or to avoid angering a superior. Putting several people in a room together is bound to create a lot of conversation; if everyone contributes, there is less time for individuals to share all of their ideas. Some people may think less critically about a problem because they are happy to let others do the heavy lifting. In addition to idea quality, the researchers also tried to measure one of the predispositions of group dynamics that they believe creates a roadblock to innovation — build-up, or the tendency of people to suggest ideas similar to one that has already been proposed, and embraced by, the unit. They found that ideas built around other ideas are not statistically better than any random suggestion.